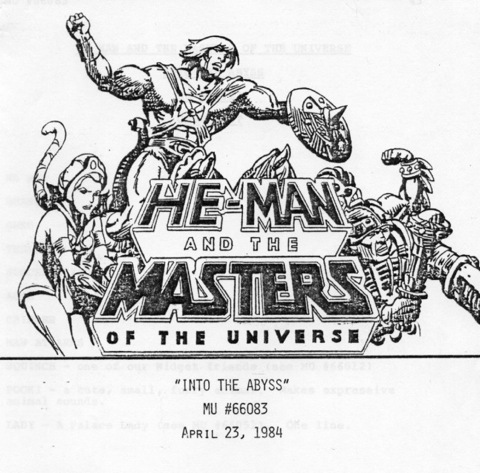 My storyboarding experience during the second season of He-Man and the Masters of the Universe was not as rewarding as the first season. While I labored through the miserable experience of boarding “Fisto’s Forest,” I experienced DiTillio withdrawal. All but one of the first season He-Man shows I boarded were written by Larry DiTillio and I grew accustomed to his excellent storytelling and sense of humor. None of which was present in “Fisto’s Forest.” I also lamented the lack of stories dealing with the unique aspects of Eternia and the mythology crafted in the Masters of the Universe bible written by Michael Halperin. One day while taking a short break from Fisto, I stared at the cutaway drawing of Castle Grayskull on my office wall (see image at right). 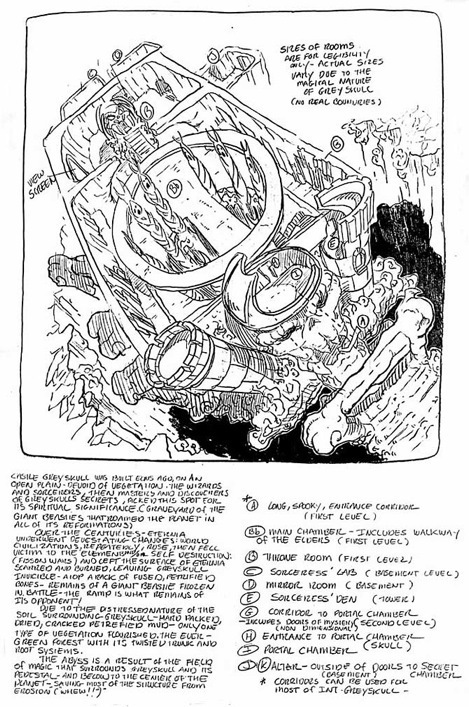 Lorenzo Martinez, background layout supervisor, had detailed notes about the nature and features of Grayskull, most of which did not appear in the stories. 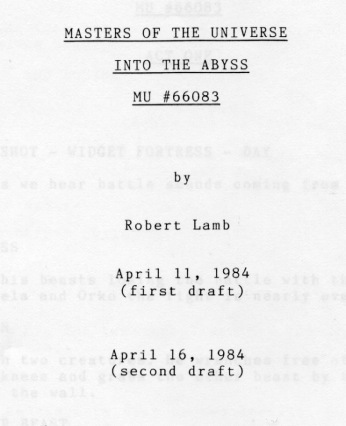 The caption telling of an abyss that surrounded the castle like a bottomless moat intrigued me. 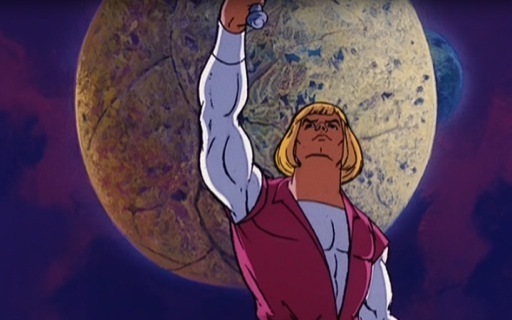 What if someone fell down into the abyss (safely, of course) and witnessed the Power of Grayskull erupt from the bowels of Eternia when Prince Adam lifted his sword to transform into He-Man. That started the gears turning. I finished my day’s work on Fisto and thought of the abyss as I drove home from Filmation. That night I composed a three-page outline briefly describing an attack on Castle Grayskull by Skeletor. As He-Man, Teela, Man-At-Arms, Ram Man, and Orko defend the castle, Skeletor blasts Teela with his Havoc Staff knocking her off the ramp and into the abyss! Skeletor taunts the horrified heroes. “What’s the matter, He-Man? Lose your girlfriend?” He-Man lunges for Skeletor who vanishes in fright from the furious hero. The rescue remained the same through each draft of the story. But in my first draft outline Skeletor gains entrance into Grayskull while He-Man and the others are rescuing Teela. The Sorceress is intensely focusing on Teela when Skeletor announces, “Grayskull is mine! You are doomed; just like He-Man and that stupid girl, Teela!” The Sorceress answers him through clenched teeth as the walls start to glow and distant lightning flashes. “What are you, her mother?” (my favorite line that sadly was never used). Suddenly, the walls of Grayskull glow brightly and discharge great power to the Sorceress. She unleashes it at Skeletor and his minions who disappear and reappear inside a small crystal. The Sorceress threatens them with Teela’s fate should Teela not return. The heroes rescue Teela and the Sorceress zaps the villains back to Snake Mountain with a healthy dose of amnesia. “What was I going to do today?” The story ended with a reference to Teela’s mother, the Sorceress. I presented my story outline to Arthur Nadel who presided over the writing department. I hoped that Larry DiTillio would take my story and write a great script that I could board. But Larry was busy on another assignment. Arthur asked if I would like to write the script myself. I did not expect that but eagerly agreed. 2.The Sorceress would not threaten to drop anyone into a bottomless pit. 3.Make Teela’s fall accidental and not the result of a direct hit. 4.Reduce the rescue party to He-Man, Man-At-Arms, and Orko. Ram-Man didn’t make the cut. Castle Grayskull cutaway by Lorenzo Martinez, Background Supervisor. So after another 8 hours of toiling in Fisto’s Forest, I returned home to my Brother typewriter and wrote a more detailed outline—without Skeletor. I started the story with the Sorceress thanking He-Man, Teela and Orko for coming to the aid of the Widgets, referring to an offscreen battle with Skeletor. 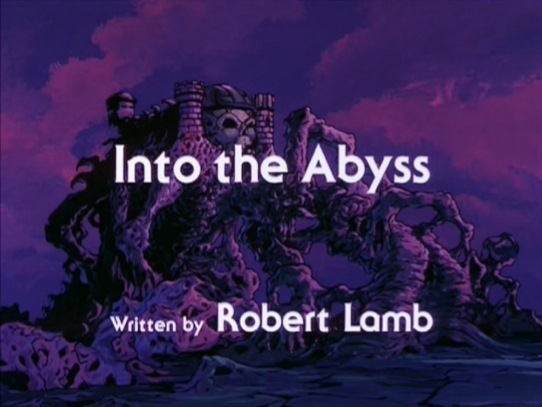 Leaving Castle Grayskull, I introduced the bottomless abyss. Back at the palace Teela searches for Adam who failed to show up for survival training. Arthur liked the training-disguised-as-play idea instead of another Skeletor battle. Except for my attempt to reintroduce the carefree ladies man aspect of Prince Adam’s character that was mentioned in the comics and series bible, this outline was very close to what appeared in the finished episode. With the green light from Arthur, I started writing the first draft of the screenplay at night after a full day of boarding Fisto. It took me about a week to finish it. It was too long, of course, and too talky in spots, especially the opening scene with He-Man telling the Sorceress about the Widget battle. Arthur told me to dramatize the battle at the Widgets’ Fortress and use BeastMan rather than Skeletor. This is how the mini-episode was inserted. Back at the Palace, I expanded Teela’s search for Adam to include an encounter with King Randor and Queen Marlena in which Randor expresses his disappointment with his son. Then Teela tries the Royal Library and finds Orko looking for magic spells in a book. “Eenie-meenie, chili-beanie? What kind of magic is that?” (My homage to Rocky and Bullwinkle) When Orko acts evasive about Adam’s whereabouts, Teela turns on the charm. Orko sighs and tells her Adam went to the theater to see Man-E-Faces. At the theater, Teela finds Ram Man helping Man-E-Faces rehearse his lines. Ram Man is annoyed at saying a girl’s lines. “I’m not a girl!” To which Man-E indicates his gladiator skirt. Teela moves out to a balcony overlooking the courtyard where Adam is flirting with two ladies of the court. My attempt to show some palace life and some character bits went on too long and were cut along with the ladies. My first draft of the exchange between Teela and Adam was a bit snarkier than the final version. With Arthur’s edits, I toned down Adam’s sarcasm. One line I couldn’t keep because the above scenes being cut was “I’m tired of seeing the disappointment in my father’s eyes.” when Adam complained of being tired of He-Man. But it wouldn’t have the same impact without the scene with the King and Queen. The picnic and Hide-and-Seek tracking sequence stayed pretty much intact from this first draft to the final script. His staging of the action was superb. 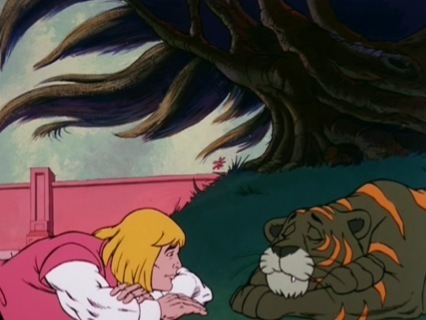 My favorite scenes were the dramatic angle of Adam drawing his sword to transform into He-Man and how he staged Adam and Cringer lounging under a tree when Teela found him. I loved the two-shot of Adam and Cringer facing each other laying on the ground. The staging of that sequence was all Bob Forward. He enhanced what I wrote with dynamic composition and thoughtful character posing. Originally I had Teela’s fall into the abyss at the end of Act 1 before the commercial break. Arthur had me move the act break so that she was still hanging onto the edge of the ramp to Grayskull at the beginning of Act 2 and then she falls. When the Sorceress learned of Teela’s fall, I had her react in horror. “NOOOOO!” Yeah, it was too much and Arthur had me tone it down to “Oh no!” What did survive to the final script was reconnecting the Sorceress and Teela as mother and daughter, at least through their feelings. I dramatized the opening battle with Beastman and the Widgets and deleted all the palace scenes except for Teela checking Adam’s bedroom. This draft is what appears in the final episode. My script was assigned to Bob Forward to storyboard. Bob is a great writer who wrote many excellent scripts for He-Man and She-Ra. 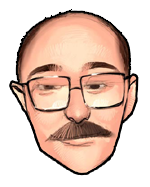 Eventually Bob moved from the storyboard department to writing about the time I left writing to return to storyboarding. 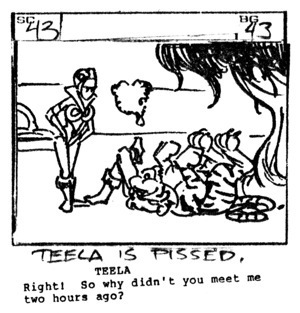 Bob put Teela’s fall back to the end of Act 1 where it belonged without knowing that was my original intent. Arthur was pleased with my first writing effort and asked if I had any other story ideas. Of course, I did. Anything to get me out of Fisto’s Forest! Into The Abyss storyboard panel by Bob Forward. Into The Abyss storyboard panels by Bob Forward.